Has four outlets and heavy-duty 20 amp IEC. Power cord included. Shipped free within the USA. 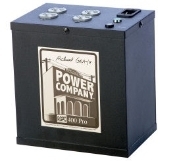 Please visit the Richard Gray's Power Company Product Information page for complete details on this product.